The ASAP Eureka! Award is an extraordinary and prestigious opportunity to be recognized for your talent and initiative. The award recognizes an achievement made by an administrative professional who has made innovative contributions to the organization for which he or she works. Are you the next ASAP Eureka! Award winner? 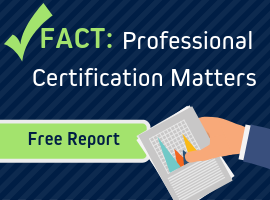 Have you created and carried out a project that produced real results for your company? Have you created a solution that saved money or time (or both)? Have you developed a breakthrough idea to reduce errors or increase productivity? Has your creative “out of the box” thinking helped motivate your boss or team to find the way forward on a challenging project? Initiating and carrying out a fresh approach or creating a breakthrough to solve a problem or make an improvement of significance related to office or support operations. An initiative that was completed sometime between January 2017 and June 2018. The resulting practices must be in place for at least 3 months prior to the application deadline. A minimum of a 250-word description of the project, complete responses to all application questions, as well as relevant examples and proof of results. Supporting documents must include at least two of the following: cost savings, increased efficiency or productivity, problem resolution, enhanced morale, stronger accuracy and integrity of operations, increased customer satisfaction, increased teamwork and collaboration. We are also happy to receive 1-2 testimonials from managers or colleagues about the efficacy of the project. The ASAP Eureka! Award application and supporting document(s) must be received by May 31, 2019. Finalists will be required to sign a letter of verification upon request. The winner must be present to receive the award and must attend the entire Administrative Professionals Conference (APC) in New Orleans. If the winner cannot meet these terms, ASAP reserves the right to forfeit the prize and choose an alternative winner. Hotel and airfare accommodations will be booked through APC's travel agent. ASAP will cover hotel accommodations for a maximum of three nights, and coach roundtrip airfare up to $500 with advance reservations within North America and the U.S. The project must have been developed and implemented by an administrative professional. This includes professionals with the functions and titles of Executive Assistant, Administrative Assistant, Business Administrator, Personal Assistant, Secretary, Office Manager, Administrative Specialist, Office Coordinator, Executive Secretary and Receptionist (or a related job title with similar responsibilities). It is open to residents of North America only. 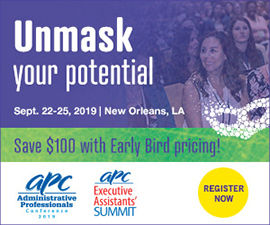 If your initiative is chosen as the winning entry, you’ll receive coach round-trip airfare (up to $500), hotel accommodations for 3 nights at the Hyatt Regency New Orleans, and a Value Pass registration to the 2019 Administrative Professionals Conference. The ASAP Eureka! Award will be presented at the APC, and the project summary will be featured on the ASAP website.